Can the Market Solve an Affordable Housing Crisis? Here’s the paradox of affordable housing in New York City: The red-hot markets of gentrifying neighborhoods are both decried as the problem, because they displace existing tenants, and hailed as the solution, because of their appeal to real estate investors. On the chalkboard of an economics class, at least, it should have worked that way. But “supply and demand” in urban housing isn’t straightforward. New York City added 180,000 units of housing between 2002 and 2011 — more than the 167,000 people it added between 2000 and 2010 — and the vacancy rate has risen slightly. Yet the median apartment rent rose by 75 percent between 2000 and 2012, even as real incomes fell. The idea of “filtering,” that a boom in high-end construction should relieve the housing crunch at large, has not held water. Mayor Bill de Blasio, the most progressive of last year’s candidates, has avoided his predecessor’s ham-fisted rhetoric in his first 12 months in office. But despite his proletarian bluster, he has a deep affinity for the real estate industry. The former public advocate — sworn in one year ago this week — is relying on new, market-rate construction to alleviate the housing crisis as much as Bloomberg was. Heralded as the most ambitious municipal housing initiative in American history, de Blasio’s “Housing New York” plan is 117 pages long. It contains prescriptions on a wide range of issues, some in the city’s control and some not. Yet the key to the plan is leverage: having investor contributions triple or even quadruple the city’s own financial stake. That’s one reason why building affordable housing, in New York City, is considered an economic development issue. 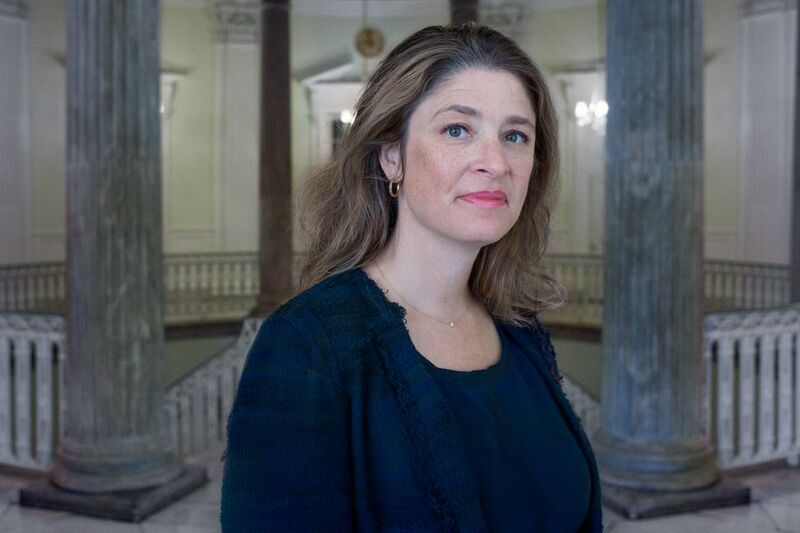 In this administration, the task falls under Alicia Glen, a former Goldman Sachs executive who was one of de Blasio’s early cabinet appointees. With the Mayor’s consent, she changed the title of her job to suit her mission: Glen is New York’s first deputy mayor for housing and economic development. “I said, ‘It strikes me that this could be a real reflection of how important this is to this administration, so let’s change the name.’ He said, ‘That’s a good idea,’” Glen recalled when we met at City Hall this fall. 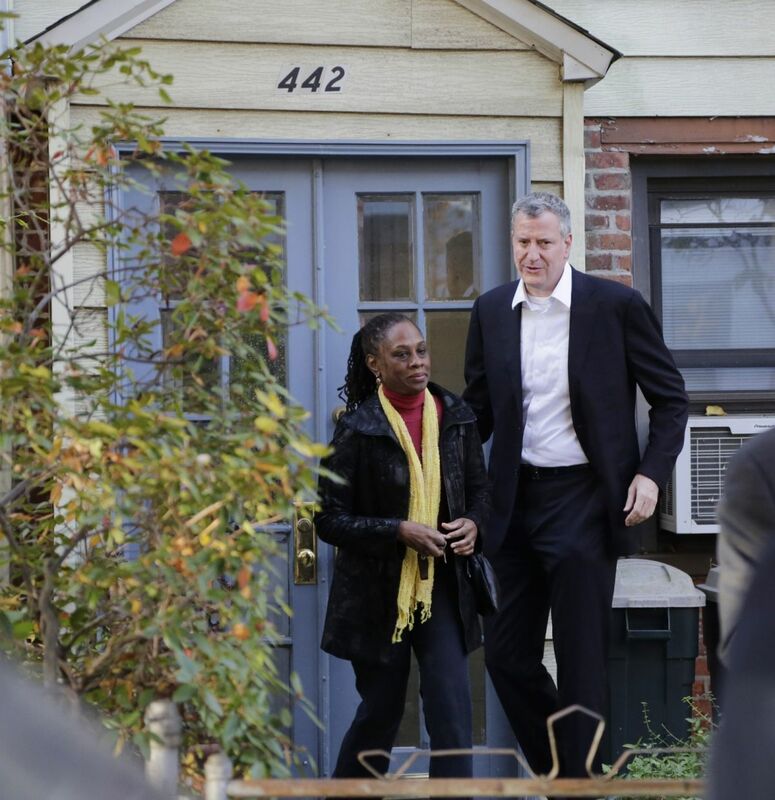 Though appointed by de Blasio, Glen sometimes sounds more like her predecessor. “Rents are rising, the market’s hot, it’s great,” she said at a conference this fall, echoing Bloomberg. “What appears to be the insatiable appetite for New York real estate is something we completely embrace,” she told The Real Deal this summer. The tools have arrived. These include new requirements and incentives all designed with the audacious goal of getting the private sector to build about half of the 80,000 new affordable units her boss has promised the impatient New Yorkers who elected him. More broadly, the administration hopes that private funding sources will augment public investment by a factor of three or more. New York City will commit $8.2 billion to the cause, along with $2.9 billion in state and federal funds. Glen and de Blasio hope to bolster that sum with $30 billion in private investment. “The plan incorporates cross-subsidization more than any plan I’ve ever seen in the country,” Andrew Ditton, the managing director of Citi Community Capital, told an audience of architects, planners and developers at a summit held by the Municipal Arts Society in October. Entrusting affordable housing to real estate developers is a bit like going to McDonald’s to lose weight. But this is the conventional wisdom in high-cost, capitalist cities like San Francisco and London. In New York too, the wagon of affordability will be hitched to the engine of high-end development. It’s an efficient use of public dollars. But does it work? Interest rates are low, demand is high, and the city is at a political consensus about the urgency of the affordable housing crisis. If the plan falls far short of its goals, it won’t just be a setback for New York’s progressive mayor. It will go a great length toward disqualifying the dominant municipal philosophy of affordable housing, which eschews widespread regulation in favor of leverage, incentives and a hearty embrace of real estate power. In order to solve the affordable housing crisis, such a plan must stoke the fire that created it. The housing crisis in New York is among the biggest on the planet. According to a recent report from McKinsey Global Institute, the cumulative distance between what New Yorkers should pay for housing (30 percent of income is the most common metric) and what they do pay for housing is $18 billion. No metro area in the world has a larger “affordability gap” than New York. The burden is particularly pronounced for families making less than 50 percent of the area median income (under $42,000 for a family of four). More than eight of 10 such families are “rent-burdened.” But the problem continues up the economic ladder: More than 60 percent of families making between $42,000 and $67,000 are rent-burdened. 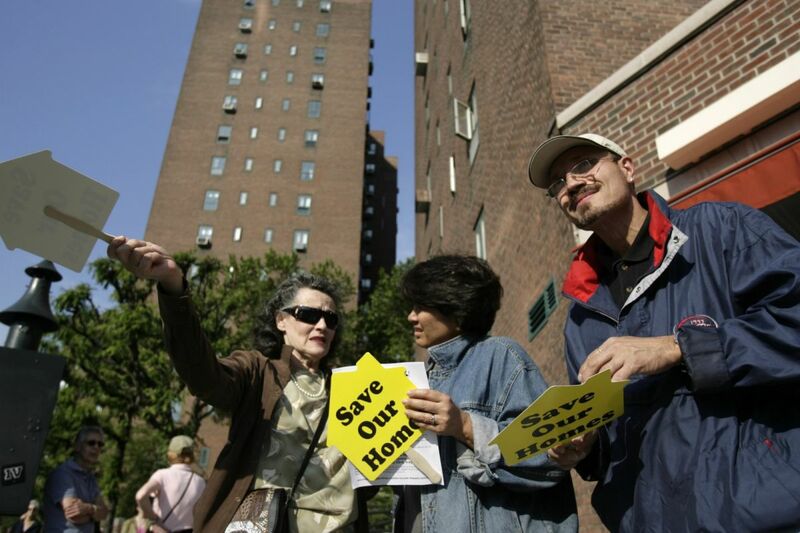 More than 30 percent of New York tenants spend more than half their income on housing. A family applying by lottery for a new affordable apartment in Manhattan typically faces odds of more than 400 to one. The de Blasio housing plan, released in May of this year, calls for 200,000 units of affordable housing over the coming decade: 80,000 new units and 120,000 “preserved” units, prevented from exiting the city’s litany of subsidy programs. The administration’s reliance on the private sector differentiates the current plan from the ambitious post-war housing program that created the five boroughs as we know them today. The crisis of that period — an estimated shortage of 430,000 housing units in 1950 — resulted in the clearance of dozens of “slum” neighborhoods and the construction of nearly 150,000 units of public housing (now considered the rare success, in the American context, of the public model). Second, New York State inherited jurisdiction over federally imposed rent control. The antecedent of today’s stabilization program, it covered an astonishing two million New York City apartments in 1950. Given the emphasis on leveraging public investment in the current plan, it is no surprise that Glen was one of de Blasio’s first major appointments. A New York native, Glen trained as a lawyer and worked as an assistant housing commissioner in the Giuliani administration. She may have inherited a penchant for law and the work of government; her father served as a city attorney under Mayor Ed Koch and her mother was a State Supreme Court Justice who went on to become dean of the City University of New York School of Law. But Glen was hired for her work at Goldman Sachs, where she ran the Urban Investment Group, an initiative to direct investors toward inner-city projects that banks had long ignored — including more than $5 billion in low- and middle-income housing in the tri-state area. The work is sometimes described as social investing, or double-bottom-line investing, because it’s both profitable and progressive. Her job in the new administration, in a sense, is carrying forward that work: convincing businesses, developers and investors that there’s money to be made in New York City, and that it can be made even in less affluent neighborhoods, and on more unconventional projects. This is especially important for the housing construction sector, which has recovered more slowly in New York than in rival high-cost cities like Washington, D.C., San Francisco and Boston. Going forward, any residential project taking advantage of a neighborhood rezoning or seeking a zoning change will be required to include units of affordable housing. This program, called “mandatory inclusionary zoning,” is intended to improve on the meager total of the Bloomberg administration’s optional inclusionary zoning program, which produced only 2,700 affordable units in a decade. The de Blasio administration, which expects 20 to 30 percent of privately financed units to be affordable, will need to surpass that 10-year total each year. Like nearly every municipal affordable housing plan, de Blasio’s is split between preservation and development. But despite the numerical mismatch, the emphasis is very much on the latter. The regulated rental stock may actually be smaller, in a decade, than it is now. De Blasio’s preservation goal is just a modest improvement on Bloomberg’s achievement. A large number of affordable units, created by private developers during the Koch, Giuliani and Bloomberg administrations, will begin to exit subsidy agreements in large numbers starting in 2017. From then on, the city stands to lose (on average) more than 11,000 affordable units a year. De Blasio’s preservation goals will likely target these apartments. But the biggest portion of the city’s affordable stock is one over which de Blasio has little control: the remaining one million rent-regulated apartments. Over the past two decades, New York City’s rental stock has grown and changed. In 2011, the share of rental units under regulation stood at 47 percent, down from 59 percent in 1991. Some of that decline can be attributed to new market-rate rentals. But the absolute decline in apartments under regulation has been huge: The city endured a net loss of more than 150,000 rent-regulated units between 1994 and 2012. For perspective, that’s equivalent to the entire housing stock of Cincinnati. Since its inception, rent regulation has been the enemy of property owners, real estate developers and economists who argue that their subsidy for longtime residents stunts the city’s continuing evolution, strains landlords and distorts the city’s housing market. Indeed, the programs do little for new arrivals. By keeping units off the open market, they likely drive up newcomers’ housing costs. But the state’s two rent regulation programs, with a median tenant income of $36,000, remain the most powerful single guardian of New York City’s economic diversity. Various exit opportunities have allowed the stock to shrink dramatically as a portion of the city’s portfolio. De Blasio has pushed to wrest control of the regulations from Albany, but since Republicans retained a majority in the New York State Senate last month, the Mayor’s goal now looks unlikely. Barring a surprising intervention in the state capital, the program’s reach will continue to diminish, putting a lot of pressure on the city’s ability to preserve what affordable housing it can. With limited room to expand preservation programs, de Blasio must hope developers can pick up the slack. Earlier this year, the de Blasio administration reached a deal with Forest City Ratner, developer of the Brooklyn project formerly known as Atlantic Yards. It was one of Glen’s first major affordable housing negotiations with a developer, but though the administration celebrated the outcome, not everyone was pleased. Back in 2007, when the project was still in planning phases, de Blasio, then a councilman from neighboring Park Slope, asserted that the Atlantic Yards’ affordability limit ought to be $80,000 (income for a family of four) — and “definitely” below six figures. Half of the affordable apartments in the first two towers will now be rented to families with incomes of up to $138,000. Critics have a point: The metropolitan “area median income” measurement, which determines which projects qualify for the Low-Income Housing Tax Credit, is ill-suited for urban neighborhoods. Staten Island is the only one of the city’s five boroughs with a median income that surpasses the area median income. In the Bronx communities where the most affordable housing has been built, the majority of residents earn less than 40 percent of the AMI. That means that those affordable apartments — which largely target residents earning 60 percent of AMI (the limit imposed by LIHTC) — are unaffordable to many people in those neighborhoods. Equating lower and higher degrees of subsidy serves to inflate the affordable housing record of politicians. But the Atlantic Yards deal reflects an uncomfortable truth of housing construction in New York: Even units affordable to those who make considerably more than the city’s median income are not being built without subsidy. No one sees that changing in the near future. To some extent, he emphasized, this has always been true. In addition to using federal money to demolish older neighborhoods and build public housing, New York has subsidized private affordable housing construction since the 1940s. Cooperatives like Penn South, on Manhattan’s West Side, were built with labor financing on land seized and donated by the city. These days, developers use the Low-Income Housing Tax Credit to build most of America’s new affordable housing. But federal LIHTC standards — below 50 or 60 percent of AMI — assume affordable housing is still for the truly poor. In New York City, the portion of the population that requires subsidized housing is much larger than that. Consider the past 10 years: The percentage of market-rate apartments affordable to those making less than 50 percent of the NYC median income has dropped from 6.2 to 4.4 percent. For those making up to 80 percent of NYC AMI, the percentage has fallen from 38 to 24. For those at the city median, the decline was sharpest of all. In 2002, 63 percent of the city’s unregulated stock was affordable. By 2008, just six years later, that had fallen to 42 percent. Affordable housing in New York isn’t just for those who have fallen on hard times, or those who would otherwise be considered poor. “It’s all the people we deal with every day,” Housing Commissioner Vicki Been said at an Urban Land Institute conference in October. The housing market is beyond the reach of half of the city, and rapidly slipping away. While the city can do its share to expedite housing construction, it can’t do much about the cost of labor, materials or land. The average price of land in Brooklyn, the city’s most populous borough, rose 25 percent between September 2013 and 2014. In some of the borough’s neighborhoods the increase was larger: Between January 2013 and 2014, land prices in Downtown Brooklyn (the focus of a major Bloomberg-era rezoning) rose from $75 to $350 a square foot. Prices for land in East New York, an area targeted by the de Blasio housing plan, nearly tripled in the first eight months of 2014. The high cost of building, and the hunger for high-end apartments, is skewing the city’s production rate. The New York Building Congress projects that residential construction spending will hit $12.4 billion by 2016, more than twice what was spent at the peak of the market in 2007. But the city will only see about 24,000 units at that time, the NYBC estimates, less than 75 percent of the 2007 total. 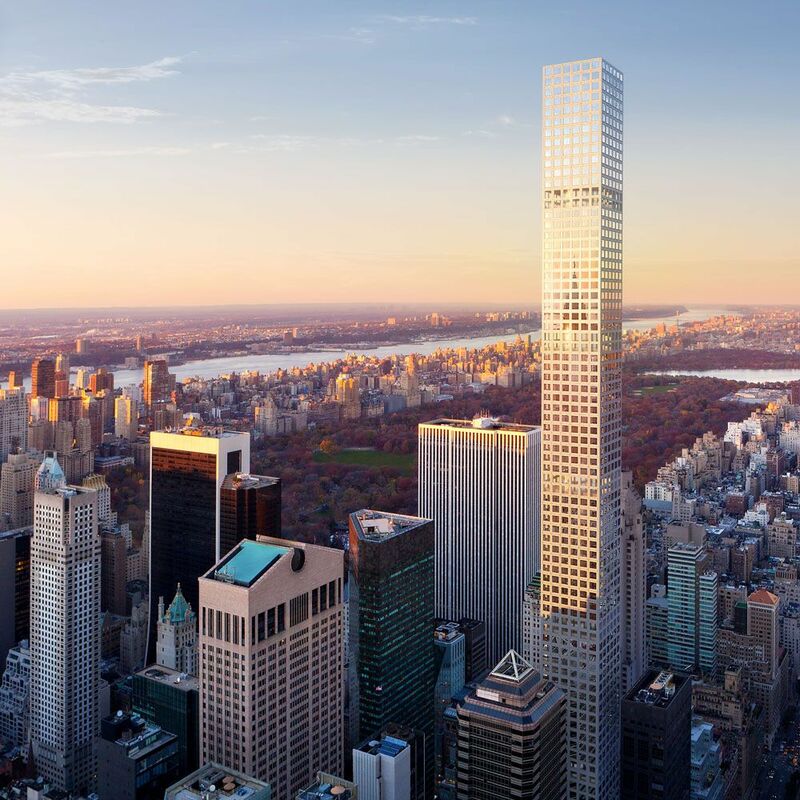 To understand this dynamic, think about the ultra-luxury skyscraper 432 Park Avenue that topped out in October. The cumulative price of the 104 apartments contained in the gleaming tower is greater than all the residential real estate in Hartford, Connecticut. The de Blasio administration has discussed a range of possible tactics to compensate for this structural imbalance and encourage affordable construction. A higher tax on vacant land. A higher tax on mansions. A mandatory inclusionary program that allows for off-site construction. Speeding the urban land use review process. Reforming tax incentives. Relaxing zoning restrictions. But many experts don’t believe New York City is capable of fixing its housing market alone. Regulation is controlled by the state. Federal subsidy to homeowners is about $175 billion, compared to hardly $25 billion in Low-Income Housing Tax Credits and Section 8 vouchers combined. As in most metropolitan areas, high-income households are disproportionately to be found in the suburbs. New construction, however, is one area the city can, for the most part, control. An affordable housing plan centered on private investors may be a neoliberal approach, but it’s also a reaction to strong political constraints. In forging a strong link between market-rate development and affordable housing, the administration walks a tightrope. Stunting the returns on residential investment may deter new projects. Not enough pressure, and affordable housing targets will be forgotten in a rush of new, expensive buildings. Who will leave New York first: real estate investors in search of higher profits, or the poor in search of lower rents? New York City, to a greater extent than its rival London, has always relished its identity as a center of both capital accumulation and working-class progressivism. Has the latter been displaced by the former? For New Yorkers who lived through the decades of disinvestment, the current strategy is worrisome in the burden that it places on developers. “We have to be careful of laying every problem at the foot of an increasing real estate market,” says Jerilyn Perine, the author of Bloomberg’s 2002 New Housing Marketplace Plan and the executive director of the Citizens Housing and Planning Council. “Now it’s impossible for people to imagine, but there was a time when nobody wanted to build on the Williamsburg waterfront. 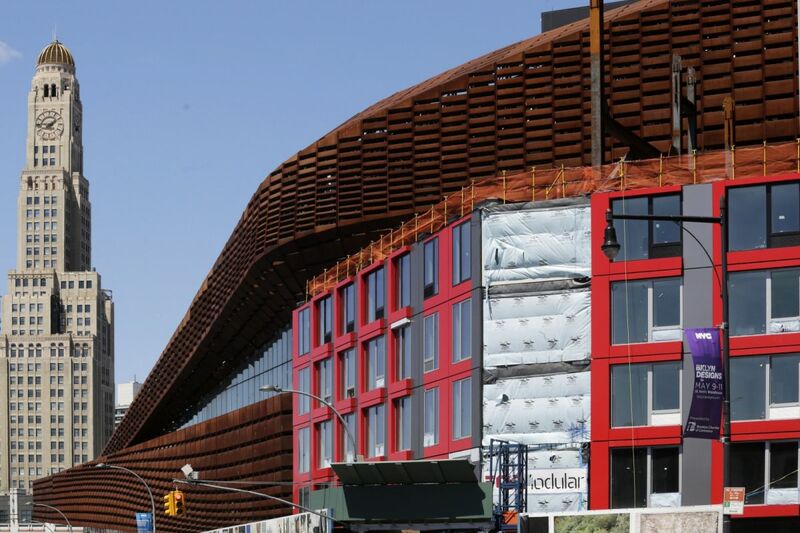 And it went on for like a decade.” Some Bloomberg-era rezonings, like on the Lower Grand Concourse in the South Bronx, have yet to produce major waves of construction. In either case, the rental emergency in New York would be prolonged. What are the consequences of an ongoing crisis in urban affordability? In London, it scuttled Boris Johnson’s plan to schedule truck deliveries at night, because faraway workers can’t make it in and out of the city after the transit systems close. In San Francisco, it contributed to support for a municipal minimum wage hike that passed a referendum in November. In New York, it has coincided with an increasing rate of suburban poverty and rapid displacement in newly hip urban neighborhoods. It’s almost certainly hampering New York’s population growth vis-à-vis Sun Belt cities where housing is cheap. Finally, the larger the fraction of wages accumulated by landlords, the less that winds up in local stores and restaurants. The rental crisis was a major factor in getting de Blasio elected. Can it garner support for an affordable housing strategy that — like the great rent strikes of the 1920s — departs from the financial logic of progressive capitalism? As the crisis worsens, does the constituency for a radical approach to housing policy expand? Or, on the contrary, does affordability diminish and finally vanish as a force in New York City politics? As the service workers of America’s greatest city are exiled along the commuter rail lines of New Jersey and Long Island, is the burden transferred to a new group within the city? Or does it simply cease to be a municipal concern?